Microsoft’s Bing has been trying to chip away at Google’s prime position in a number of ways, and now the search engine has revealed a new social integration strategy sure to get industry experts talking. As an increasing number of web users turn to social networks for information and breaking news, search engines are being forced to reassess their traditional methods of ranking. This means that search engine results are changing, and the introduction of ties with Twitter and Facebook indicates Bing is embracing the new order. The search engine will now offer real-time Twitter updates in Bing News, as well as in other SERPS, as a way to offer searchers up-to-date and breaking news in their search results. This way, the search engine hopes it will allow users to keep on top of trending topics without bypassing the search engine altogether. This is the kind of move search engines need to be making if they want to engage with a new audience, claims SEO company Queryclick.com. A spokesperson said: “Integration like this is the best way search engines have of safeguarding their position as the top place for searchers. Additionally, Bing has announced a new partnership with Facebook, which will see Bing’s entertainment results instantly shared to Facebook users, if they are signed in to both. This feature will utilise Bing’s liked Results functionality and will allow users to share news of their favourite films, artists, musicians and TV shows to all of their Facebook friends. The Bing and Facebook integration will also offer an overview tab that will allow Facebook users to update their statuses directly from the Bing entertainment results. By keeping users in the search results, Bing could create an advantage for itself, said search engine optimisation experts explained. “If Bing can persuade its searchers to update their Facebook pages without having to leave the SERPs, it will have achieved something of a coup. True to form, the world of social media shows little sign of slowing down in terms of infiltrating every aspect of our lives; search engines being no exception. While Google laid bare plans to include relevant content from social media sources such as YouTube, Flickr and Twitter, Microsoft’s own search engine – Bing – has been preparing its move into the realm of social search with a much touted tie with Facebook. Now Facebook “liked results” will become integrated with everyday Bing searches which Bing’s development team described as “part of a longer journey” into an improved cohesion between search and the social sphere. “QueryClick are not surprised to see Bing announce a tie with Facebook in a bid to keep shoulder to shoulder with Google following the launch of the latter’s real time, social media search results some 18 months ago. “The ability to ‘like’ search results and see those that your friends have ‘liked’ is another step closer to a much more personalised search experience that pulls in the activities and opinions of an individual’s social circle. The introduction of the ‘Bing Bar’ – a simple tool bar function – will also serve to blur the line between search engine and social media platform even further. Microsoft’s bid at the search engine market has been slowly chipping away at Google’s stupendous lead, but Bing still has a long way to go before it could have any dreams of clinching the top spot. 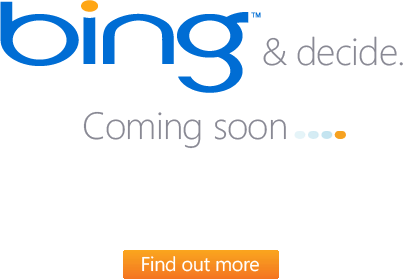 However, a massive upgrade to the decision engine could see Bing with a new selection of offerings that will draw young, savvy searchers its way. One of the biggest changes are the way the engine will return some searches with less of a traditional results page and more an interactive app that allows searchers to quickly modify the results. The other is the inclusion of a social search feature. By teaming up with Facebook, Bing will look through recommendations made by your friends in the aim of returning more relevant and personalised results to your searches. A spokesperson for SEO company Queryclick.com said this was a good choice for the company, and one that could pay off for it in the future. “When you look back at the way the social market has grown in the last few years, it’s clear to see that more and more people are turning to the internet as a way to interact with friends as well as a way to find information. The new feature is the result of a deal between the decision engine and the leading social networking site. Providing users have recently logged into their Facebook account, Bing will automatically recognise their account and search through all of the content associated friends have chosen to click a ‘Like’ button for. The brand power of Facebook could be a huge asset to the decision engine and the partnership could also see Bing able to offer something new to the search market. While Google has also attempted to tap into the social networking market, its success has been nowhere near that of Facebook, and by partnering with the biggest social networking site of the time Bing may have the power to shake the foundations of Google’s prime position. It’s been reported that Microsoft is on the brink of revealing a web connected television service that will directly rival those of its main competitors, Google and Apple. The new device is expected to be showcased at the Consumer Electronics Show in Las Vegas, and will mark yet another effort by the software giant to beat rivals by releasing its own version of already hyped products, claimed a spokesperson for SEO company Queryclick.com. However, this isn’t the first time Microsoft has made a foray into online TV. Back in 2002 it launched a media centre platform which, while innovative, didn’t have the audience reach needed to make it a success at the time. It’s a different story these days, and Microsoft could be in a position to release a very strong TV offering. Brier Dudley of the Seattle Times explained that the device uses a version of software used in Microsoft’s embedded device software overlaid with the interface used by Windows Media Centre. It will offer media streaming and remote-control capabilities. SEO company Queryclick.com said Microsoft could gain a lot of traction in the market by pipping Google to the post with its release of the new software. “Despite a slow start, Apple has since had a lot of success with its TV offering and it was no surprise to us that Google would be running with the innovation. At the end of last year there were reports that Google asked a number of its TV-manufacturing partners to delay the release of their Google TV units as a direct result of complaints from early critics. In a bid to continue taking noticeable bites out of Google’s market share, Bing has unleashed yet another ground-breaking web-based application to woo searchers. An add-on to Bing Maps, the cutting-edge app known as ‘Taxi Fare Calculator’ now allows users to determine prospective cab costs when planning journeys in major cities. “Since the late 90s Google has held an almost unbreakable stranglehold over the search industry accounting for a staggering 60% of the market share. “Despite Bing serving a mere 12.7% of the industry, the speed with which Microsoft are swaying millions of web users is not to be ignored. The new features on Bing Maps don’t stop there however with a series of other applications that cover everything from weather reports to restaurant reviews. Weatherbug, for example, takes internet weather forecasting to an entirely new level with radar imagery, live video from observation stations and satellite technology that can accurately track and predict weather systems days in advance.